Speculative Faith | Explore Lorehaven Magazine's Fall 2018 Issue! 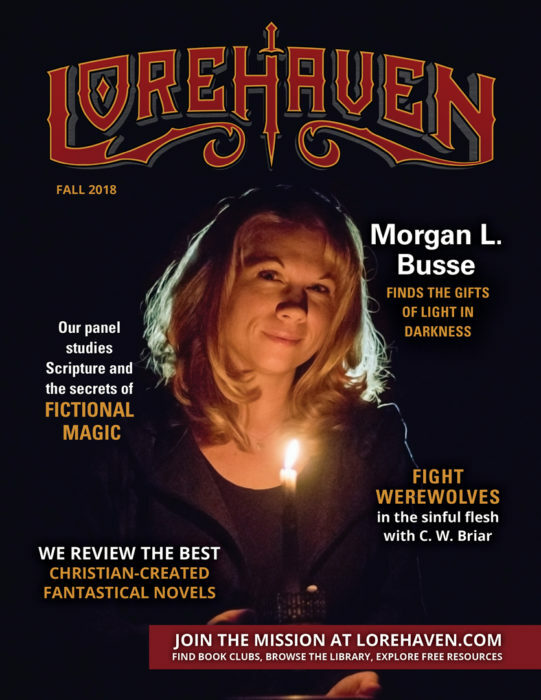 Explore Lorehaven Magazine’s Fall 2018 Issue! With your free subscription, you can read PDF copies of each issue, or explore articles at Lorehaven.com. Fantasy fans, Lorehaven Magazine’s newest issue has arrived. With your free subscription, you can read each article at Lorehaven.com, or download print-copy-style PDFs of this issue (and the spring and summer issues). SpecFaith alum Morgan L. Busse, author of November’s new release Mark of the Raven (we review it! ), finds the gifts of light in darkness. Our Roundtable panel studies Scripture and the secrets of fictional magic. Author C. W. Briar probes legends of werewolves, whose fleshly nature sounds familiar . . .
And, of course, we review the best Christian-created fantastical novels. Speaking of ads, you may notice a few of those appearing with the magazine articles at Lorehaven.com. Right now, these ads appear both in the magazine’s print version, and they now appear on the website, between magazine articles and the comments section. Note also that these ads appear even to readers who have not subscribed to the magazine. Normal ad-blockers don’t hide them! These ads also reflect the many great authors and publishers who want to share their stories with you. Be sure to join the mission at Lorehaven.com. You can also browse our virtual library that shows nearly 900 titles. Or keep enjoying daily, free articles at Speculative Faith. And be sure to share this magazine with your church, friends, family, and anyone else who would love to explore great Christian fantasy.